Occupy Wall Street (OWS) brought the increased inequality in the U.S. to the headlines, where it deserves to be. Almost a quarter of total U.S. national income now accrues to the richest 1 percent of the population, a figure that was barely above 10 percent 40 years ago. Other countries, most notably the U.K., have also witnessed growing inequality, but none competes with the U.S. in the surge in inequality. Is it unfair and unjust for so few to become so much richer than the rest? 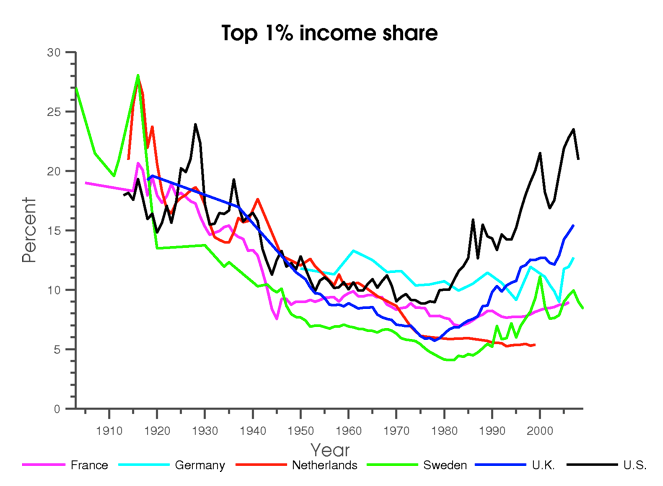 Figure: Data from Anthony Atkinson, Thomas Piketty and Emmanuel Saez. But the real reason to worry about this picture is not the unfairness of it all. Any discussion of inequality should distinguish economic inequality from inequality of opportunity and from political inequality. You may not like economic inequality but others may be indifferent to it. There are huge disagreements about how much redistribution there should be, and we know by now that very high tax rates can choke off economic incentives. The problem is that economic inequality often comes bundled with inequality of opportunity and political inequality. Prosperity depends on innovation, and we waste our innovative potential if we do not provide a level playing field for all: we don't know where the next Microsoft, Google, or Facebook will come from, and if the person who will make this happen goes to a failing school and cannot get into a good university, the chances that it will become a reality are much diminished. There is a lot to worry about here. Our schools are failing and American youth is less likely to graduate from high school or college today than in the 60s. We are no longer the country of opportunity and upward mobility that we once were -- largely because that upward mobility crucially depended on the expansion of mass schooling. The real danger to our prosperity lies in political inequality. The U.S. generated so much innovation and economic growth for the last 200 years because, by and large, it rewarded innovation and investment. This did not happen in a vacuum; it was supported by a particular set of political arrangements -- inclusive political institutions -- which prevented an elite or another narrow group from monopolizing political power and using it for their own benefit and at the expense of society. When politics gets thus hijacked, inequality of opportunity follows, for the hijackers will use their power to gain special treatment for their businesses and tilt the playing field in their favor and against their competitors. The best, and in fact the only, bulwark against this is political equality to ensure that those whose rights and interests will be trampled on have a say and can prevent it. So here is the concern: economic inequality will lead to greater political inequality, and those who are further empowered politically will use this to gain a greater economic advantage by stacking the cards in their favor and increasing economic inequality yet further -- a quintessential vicious circle. And we may be in the midst of it. The U.S. tide has lately not lifted all boats; over the last 40 years, while the richest Americans have seen a sharp increase in their incomes, the income of the median household has hardly budged. Predictably, this has gone hand-in-hand with political inequality. Yale University political scientist Robert Dahl painted a picture of U.S. politics in the 1960s through the lenses of politics in New Haven as a system in which not only the wealthy but even the little man had voice. But that system is in decline. Money matters much more in politics today than it did in the 1960s, and we are currently witnessing its import rising. The wealthy have greater access to politicians and to media, and can communicate their point of view and interests -- often masquerading as "national interest" -- much more effectively than the rest of us. How else can we explain that what is on the political agenda for the last several decades has been cutting taxes on the wealthy while almost no attention is paid to problems afflicting the poor, such as our dysfunctional penal system condemning a huge number of Americans to languish in prisons for minor crimes? How else can we explain, as political scientist Larry Bartels has documented, that U.S. Senators' votes represent the views of their rich constituents but not those of their poor ones? There is a lot to despair about. But despair would be the wrong reaction. First, we have been here before and we have rebounded. Things were much worse during the Gilded Age, and the wealthy elite more unscrupulous. Yet the robber barons did not prevail. The U.S. political system was also able to tackle the problem of Southern segregation and black disenfranchisement, which if anything looked even more insurmountable. Second, despair would strengthen the tides towards inequality. Americans are proud of their Constitution. But no constitution can enshrine political equality. It needs to be fought for and defended. Whatever we may think of the views, rhetoric, and tactics of OWS, not only does it deserve our respect for putting the question of inequality on the agenda, but also for actually standing up for political equality. Daron Acemoglu and James A. Robinson are the authors of Why Nations Fail: The Origins of Power, Prosperity, and Poverty, available March 20.